The Fifth Year students recently went on a one-day bonding trip to Avon Rí Adventure Centre, by the beautiful Blessington Lake in County Wicklow. The day trip gave the students who joined Fifth Year straight after the Junior Cert an opportunity to get to know the former TY students in a fun, relaxed setting. As a Fifth Year student, I of course went on this bonding trip. When we arrived, we were split into smaller groups and each group was assigned one of the friendly Avon Rí instructors, who would bring us around to all of the activities for the day. My group started off with canoeing and games in the lake, which was very cold, but we still had a lot of fun. Once we were dry and wrapped up in warm clothes again, we moved onto the other activities: a low ropes course, teambuilding activities, ziplining, rock climbing, archery and orienteering. By the time we were piling back onto the buses in the evening, everyone was exhausted but happy. A great day was had by all and it was a great chance to get to know the year group, as well as having a welcome break from the hustle and bustle of Fifth Year! Our new First Year students got off to an energetic start in September with a fun outdoor event. Along with their year head and form tutors they enjoyed an afternoon of highly interactive games, helping them to forge new friendships and feel at home with fellow students and staff. Decided favourites were dodge ball, charades and headbands. We wish our First Years a great year ahead. A fun and interactive workshop took place as part of Maths Week focusing on the interconnectivity between maths and music. This workshop was very much in line with Maryfield’s current focus on numeracy and the cross curricular connections that exist between various subject areas. Paco is an innovative Spanish lecturer, renowned for his methods of teaching Mathematics. He began by teaching the Transition Year students about divisions and groupings. He used a number of different methods, some of which were new to the students. Following this, the speaker focused on the rhythmic patterns that occur in music. In groups, the students clapped various rhythmic combinations both in unison and with other cross-rhythmic combinations. This workshop proved very stimulating and enjoyable for all the students involved. A group of highly enthusiastic Transition Year students payed a visit to Google. The students attended a presentation given by a real life Googler about a variety of work types engaged in by employees. These include coding, cartography and engineering. The students were given a guided tour of the Google campus and the day concluded with some problem solving exercises. A daily Maths quiz took place during Maths Week. Students were asked to submit answers to a variety of mathematical riddles. The daily winners received prizes and all participating students experienced Maths in a fun and practical way. Well done to all our lucky prize-winners! The prescribed poems in this year’s competition reflect on 1916, World War 1 and also include the work of contemporary Irish poets. All nineteen students articulated beautifully from memory their prescribed and chosen poems. Congratulations to all participants and a big thank you to all who supported this prestigious event. Nicole Mare (1R) and Nina Roe (1R). 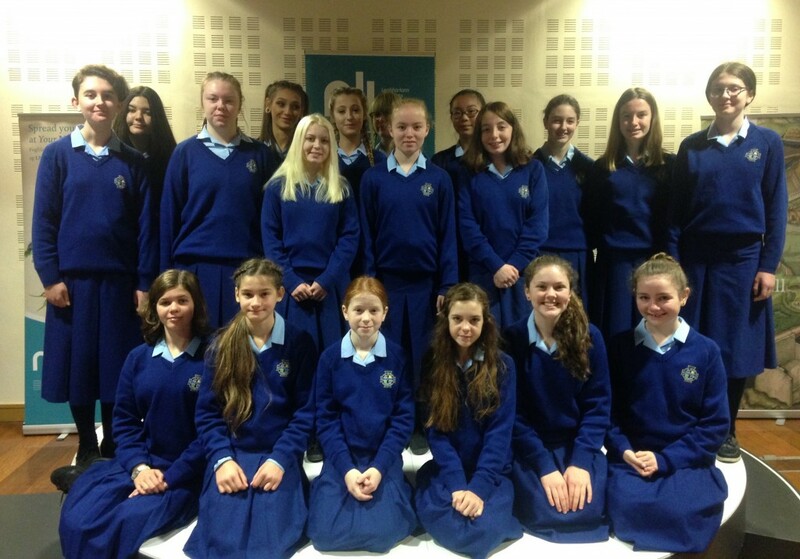 Shelby Cullen (2L), Leah Su Whelan (2K), Susan Marmion (2S), Sara Coogan (2l), Lorna Lawless (2L) and Gráinne Tancred (2K).